There are only a few hours to go until one of the Borders’ biggest rugby spectaculars of recent years. At 7.30pm tonight (Tuesday), the South of Scotland squad faces Caledonia (Caley Reds) at Riverside Park, Jedburgh. It will be only the third time this century that a full South XV, made up of club players within the Scottish Borders, will wear the famous red and white hooped jerseys. Coaches Chris Dalgleish and Kevin Barrie have selected six from Gala in the starting line-up, with four each from Jedforest and Hawick and two from Selkirk, with Melrose opting against taking part in the occasion for player welfare reasons. The side is captained by Gala’s Gregor Hunter, with Bruce McNeil of Hawick as his deputy. Injuries to James Bett and Craig Cowan have given opportunities to Chris Weir and Curtis Reynolds, who have come into the squad. Interest in this special game has resulted in the pre-match dinner, featuring former Selkirk, South of Scotland, Scotland and British Lion player, John Rutherford, being totally sold out – and there’s a tremendous buzz in the Borders, with the hope from many players and spectators that competitive District Rugby will return on a regular basis in the near future to the Scottish Rugby calendar, offering a real opportunity for club players to test themselves at a higher level. Since the final official South of Scotland match in 1995, against Griqualand West at Netherdale, the South has been resurrected on two occasions. 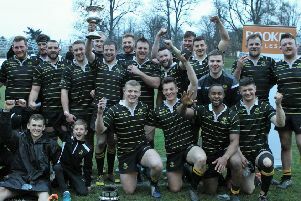 In 2009, The South beat Northumberland at Netherdale, while two years later at Mansfield Park, they also beat a strong Barbarians side containing several internationalists. Two South players from that game will be running out against Caledonia this evening – vice-captain Bruce McNeil, who captained the side that day, and Gregor Young. Tonight’s referee is high-profile New Zealander Ben O’Keefe. The Caledonia team has been put together featuring players who began playing rugby in the region. The game brings together two senior Scottish district sides for the first time since 2002. The Caledonia Reds coaching team is led by head coach Colin Sangster (Dundee High), with assistance from Niall Lear (Falkirk) and Craig Deacons (Grangemouth). Their captain is Aberdeenshire stalwart Greig Ryan. The South team comprises: 15 LEWIS YOUNG (Jedforest), 14 GRAHAM SPEIRS (Gala), 13 GREGOR YOUNG (Jedforest), 12 LEE ARMSTRONG (Hawick), 11 DARREN CLAPPERTON (Selkirk), 10 GREGOR HUNTER (Gala, captain), 9 SEAN GOODFELLOW (Jedforest). 1 SHAWN MUIR (Hawick), 2 MATT CARRYER (Gala), 3 CHRIS KEEN (Gala), 4 GREGOR LAW (Jedforest), 5 ANDREW RENWICK (Selkirk), 6 GRAHAM LOUW (Gala), 7 STUART GRAHAM (Hawick), 8 BRUCE McNEIL (Hawick, vice-captain). Replacements: 16 CALLUM MacKINTOSH (Hawick), 17 CONNOR HOGG (Jedforest), 18 CURTIS REYNOLDS (Gala), 19 IAN WALLACE (Kelso), 20 CHRIS WEIR (Gala), 21 ANDREW TAIT (Kelso), 22 ROSS NIXON (Selkirk), 23 CRAIG ROBERTSON (Gala). Coaches: Chris Dalgleish (Gala) and Kevin Barrie (Jedforest); Team Manager: Neil Hinnigan (Kelso).